Disclosure: We pay a commission to the review sites listed below when visitors click on a DreamCloud affiliate link on their sites and make a purchase. DreamCloud uses ultra-premium foams and takes the utmost care during the construction process to ensure that we achieve the optimal balance between support and comfort. When it comes to making a mattress that supports all kinds of sleeping positions (back, side, or stomach) DreamCloud supports all types of sleepers so you don’t have to compromise based on your sleeping position. DreamCloud is founded on efficiency and innovation to bring you better sleep – which includes not using middleman or having stores so that we can pass the savings on to our customers. Due to our quality construction and use of premium materials in all four layers, we can achieve the best of both worlds in hybrid and memory foam mattress. Casper Wave only uses 5 layers of foam, while DreamCloud uses 8 layers. DreamCloud is also considered a hybrid luxury mattress, whereas Casper Wave is only memory foam and does not have the spring coils which allow DreamCloud to achieve the perfect level of bounce and support. Additionally, Casper Wave only has a cushioning top layer whereas DreamCloud has a hand tufted Cashmere blend cover. DreamCloud has made it a mission to use the most premium products from around the world. Customers and review sites alike agree that DreamCloud floats at the intersection of sumptuous and luscious. According to sleepsherpa.com, “TRUETUFTED™ CASHMERE BLEND TOP [lets you] Dream your best life! DreamCloud’s Cashmere blend cover provides unmatched breathability and premium softness. DreamCloud offers a 365 day trial period, with free shipping and returns so you can try the mattress on your terms, for up to a full year. Casper Wave only offers 100 Night Home Trial period. Studies show that it can take the body over 6 weeks to adjust to a new mattresses, which means you just can’t tell in a 10 minute test of laying down on a mattress in a retail store – and you might need more than 100 nights which is just over a few months. DreamCloud offers a full risk-free 365 night trial period so you can sleep in all four seasons to make sure DreamCloud is right for you. With only a 100-night trial period, Casper Wave is asking you to make a financial commitment to a mattress you might not be able to test for as long as you would like. DreamCloud offers support and perfect alignment for your spine from the first night, and if for some reason it’s not ideal for you, you can send it back at no cost. DreamCloud customers love that they can test the mattress for a full year in order to make sure it’s the perfect supportive mattress for their sleep. DreamCloud is an employee-run business, which makes all the difference in our DreamCloud is the perfect level of firmness and support. According to sleepsherpa.com, “In terms of firmness, I would say it’s about a 6.5 out of 10 on the firmness scale with 10 being the firmest. If you want a mattress with foam layers that recovers quickly, is breathable and contours well, this would be the ideal mattress for you.” DreamCloud is a luxury hybrid mattress that is the perfect firmness, allowing it to be a comfortable mattress for any back, stomach, or side sleeper. Casper Wave is a memory foam mattress, which means it has a different level of firmness and support since it is lacking coils. DreamCloud comes in at 6.5 out of 10, which provides comfort and support. “The soft Cashmere blend cover, high density foams and encased coils allow you to experience the best sleep ever. Let’s take a deeper look at the coils: the patent pending “Bestrest” encased hypo-allergenic coils give added support and help you achieve optimal alignment of your spine. DreamCloud is designed for high performance and even distribution of pressure, while molding around your body for any position or amount of pressure and weight,” mattress-guides.net says. DreamCloud matches Casper Wave mattress with our own combination of luxury materials to provide plush, supreme comfort. However, with Casper Wave you don’t get a better mattress in fact you will pay almost 2x more for a mattress that does not use the same high level of materials such as hand tufted Cashmere blend cover and our patented coils. As sleepsherpa.com says about DreamCloud, “Although these mattresses are a little more expensive compared to others on this site, they are nowhere near the astronomical prices of other brands such as Duxiana and Kluft and Aireloom which can easily exceed, $10,000 for a mattress. I have tried some of these mattresses and although they are well made, the markups are astronomical and I think you will find some of these mattresses just as comfortable.” Casper Wave has not been proven to be more comfortable nor do they use higher quality memory foam than DreamCloud. We work to ensure that our memory foam and 8-layer system is the best in the industry. If you sleep hot, then DreamCloud is definitely for you. The DreamCloud Cashmere blend cover is actually a naturally moisture-wicking fabric that keeps you warm in the winter and cool in the summer. As one of the most expensive material to make fabric from in the world, our Cashmere blend cover is superior to any Cotton blend. In addition, DreamCloud uses a technical gel infused memory foam layer to help with cooling as you sleep throughout the night. According to realmattressreview.com, “The DreamCloud uses Gel Infused Memory foam and Latex primarily for its premium comfort foams. 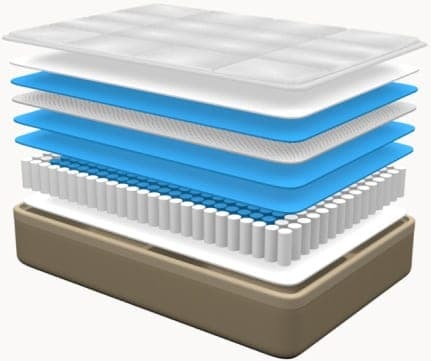 Gel memory foam sleeps much cooler than regular memory foam and latex does not trap heat hardly at all. Additionally the mattress has a coil unit instead of a foam core that helps promote airflow much better. You don’t experience an out of control amount of body hug or sinkage either so the DreamCloud sleeps very cool. Heat should not be a problem for most people on this mattress.” Like the original Casper design, the Casper Wave is made of foam — though this newer design also features a high resiliency gel as a part of its Hyper-Targeted Support™. When we set out to make the perfect mattress, motion transfer was one of our highest considerations. Motion transfer is the term used to describe movement felt from stirring or rolling over in bed – especially a problem for couples. DreamCloud does not incur motion transfer due to the combination of plush foams and supportive springs that distribute the weight evenly. “I would recommend anyone wanting to try a hybrid mattress,” says realmattressreview.com. “Those people who are looking for a legitimate mattress that is goin to hold up should try it. It was very supportive, slept cool and there was not a lot of motion transfer when Ross moved around. It was definitely one of the nicest bed in a boxes we have experienced so far.” Unlike the Casper Wave which is only memory foam, which in some cases is known to cause sinking or motion transfer, DreamCloud’s hybrid technology allows it to reduce motion transfer. The only affordable super luxury mattress to provide ultimate support and comfort, DreamCloud uses cutting-edge technology and premium materials to create the best support for your spine. Our soft Cashmere blend cover, high density foams, reinforced edges, and encased coils allow you to experience the best sleep ever. Our plush euro top serves as a contouring pillow that cradles the body and includes the Cashmere blend cover, top memory foam layer and the latex layers. Our reinforced sidewalls provide unmatched edge support for perfected sleep quality from edge to edge. Casper does not use the same reinforced sidewall support meaning that you won’t get the same level of durability – which is why DreamCloud is guaranteed to last for Everlong. With DreamCloud reinforced edges you will find that the side wall will not get blown out, and our weight limit can accommodate all types of sleepers with plush comfort and stable support. DreamCloud has taken the mattress industry by storm with leading scores from trusted third-party reviewers. Memoryfoamtalk.com summed it up best: “If you want a luxury hybrid mattress that sleeps cool and is super supportive and comfortable at a price 3-4x less than competing in-store mattresses of the same quality, with a lifetime warranty and 365 night sleep guarantee – the DreamCloud simply cannot be beat.” When deciding between DreamCloud and Casper Wave, you won’t regret choosing the Plush Life.